Michael C. Smith is the partner in charge of the Marshall office of Siebman, Forrest, Burg & Smith, LLP, where he provides clients with extensive experience in complex commercial and patent litigation heard in federal courts. Mr. Smith, who has appeared as counsel of record in over 800 cases in the U.S. District Court for the Eastern District of Texas, served as chairman of the District's Local Rules Advisory Committee from 2000-2009. 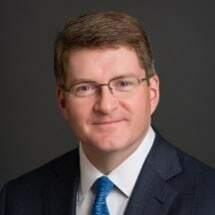 He has also been editor of the O'Connor's Federal Rules * Civil Trials handbook on federal civil procedure since 1998, and maintains the nationally recognized Eastern District of Texas Federal Court Practice web log at EDTexweblog. He is a frequent author and speaker on patent litigation, federal court practice, and law office administration, and has served in leadership roles in numerous legal organizations, including as chair of the Litigation Section of the State Bar of Texas and the Board of Editors of the Texas Bar Journal, as well as on the Board of Directors of the State Bar of Texas, and president of the Eastern District of Texas Bar Association and the East Texas chapter of the American Board of Trial Advocates (ABOTA). Mr. Smith, a Marshall native, has also been active in community affairs. He served on the Marshall City Commission for three terms, from 1996-2002, and is a former president of the Harrison County Historical Museum and the Marshall Citizens Advisory Committee and a current member of the Marshall Chamber of Commerce Board of Directors. Mr. Smith is married to Harrison County Treasurer Jamie Marie Noland. In addition to his legal writings, Mr. Smith is also the author of two books on aircraft carriers, Essex Class Carriers in action, and US Light Carriers in action, published by Squadron-Signal publications. In 2010 he was recognized by the Marshall Historic Landmark Preservation Board for renovating the historic Hub Shoe Store offices for use by his law firm.